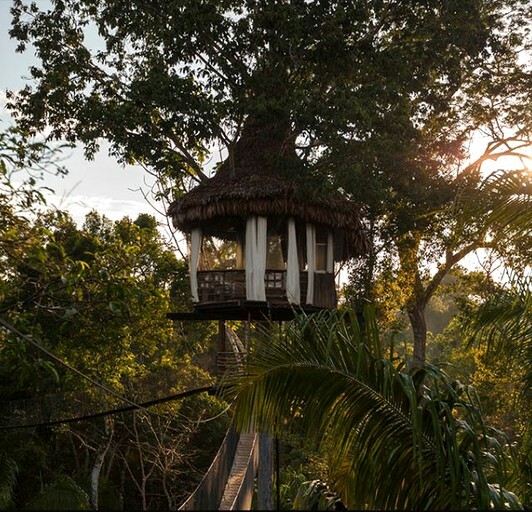 This incredible, all-inclusive tree house is located in the Amazon rainforest of Peru and is set up to ensure that glampers can enjoy their vacation in true luxury. Set 67 feet off the ground, it is the highest tree house in the complex and provides stunning views of the jungle. With a diameter of 15 feet and two twin beds, this tree house is perfect for up to two people. Mosquito mesh netting is provided to ensure guests are comfortable and protected from insects during the night. There is also a private bathroom for glampers to indulge in a cold shower following a day of exploring in the humid jungle. This stunning complex provides everything glampers could wish for on the ultimate luxury vacation. The 40-foot tall Commedor is the primary gathering place at the lodge, with an exquisite dining area located on the first floor. It is here that guests will enjoy three delicious meals each day, included in their booking fee. The dishes are all inspired by Peruvian tastes and traditions, further increasing the chance for guests to fully immerse themselves in the local environment. On the second floor, guests will find a tranquil relaxation area. Surrounded by mosquito mesh for comfort, glampers can truly unwind and enjoy the beautiful views under the open atrium and towering roof. Equipment for the countless excursions available to guests is all provided by the complex, and each trip is led by an experienced guide dedicated to each group. Safety is a huge priority in the complex, and guests will find hand rails and cables on all bridges and platforms. The booking fee includes pickup and drop-off at Iquitos Airport along, with round trip transportation via land and river to and from the lodge. In addition, it includes three quality meals a day and unlimited bottled water and juice. All excursions are included in the fee and can be arranged at the complex on arrival. Guests have the option of either Spanish or English speaking guides. Guests are advised to bring cash with them to the complex. All major expenses are taken care of in advance (lodging, excursions, food, transportation), but any additional purchases at the lodge are cash only. This includes drinks other than water or fruit juice, souvenirs, and tips. This complex offers guests the chance to truly disconnect from the outside world during their stay. For those looking to use the entire duration of their stay to relax, the second-floor space of the dining room is perfectly designed to ensure that this is possible. For glampers hoping to take advantage of the jungle setting, there are guided walks specifically related to medicinal plants, animals, and insects. Guests can also take advantage of the once in a lifetime opportunity to see pink dolphins in their natural habitat or fish for piranhas in dugout canoes. Interested in learning more about the local community? Puerto Miguel and other local villages offer guests the chance to interact with Peruvian natives. This vacation offers plenty of opportunities to ensure guests are able to fully appreciate the breathtaking setting of the Amazon. Upon booking, please advise the host of any specific dietary requirements. The only drinks included in the booking fee are water and juice. All other beverages can be purchased at the bar in the dining room, but please be aware that only cash is accepted. For the comfort and safety of guests, purified water is brought in for cooking and drinking. Please be aware that guests will not have cell service or Wi-Fi anywhere in the complex. This is a real chance for glampers to reconnect with themselves, other travelers, and the environment. The complex is not recommended for children under the age of five.